It is not difficult to see why the Spa at The Mandarin Oriental is consistently voted the among the best urban spas anywhere. There could not be a greater contrast between the bustling streets of Knightsbridge and this calm oasis. Even better the spa environment is very man friendly. We challenge you not to be instantly set at ease by the clean lines and simplicity of its interior. As the emphasis here is on wellness (promoting physical, emotional and mental well being) there is much more on offer than just the treatment booked. 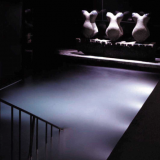 So try to arrive at least 45 mins before your appointment to take advantage of the Crystal Steam Room (where the steam enters from a huge amethyst) or take a plunge into the Vitality Pool, to be honest you should be feeling pretty relaxed even before your treatment. We chose this treatment as it was a great anti jet lag remedy, recommended for men on the go. Shiatsu master Rex Lassalle put us instantly at ease by applying finger pressure to our bodies Shiatsu points, then he applied ginger infused hot towels and finished by giving a deep massage with an oil specially selected for our needs that day. If you want to extend the ritual at home Mandarin Oriental’s signature product line (developed specifically for the Group by Aromatherapy Associates) will take some beating. 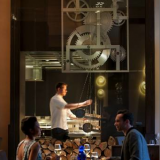 Or why not try eating at Dinner by Heston Blumenthal? 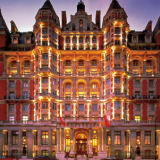 It is his first London restaurant and is also conveniently located within the hotel.